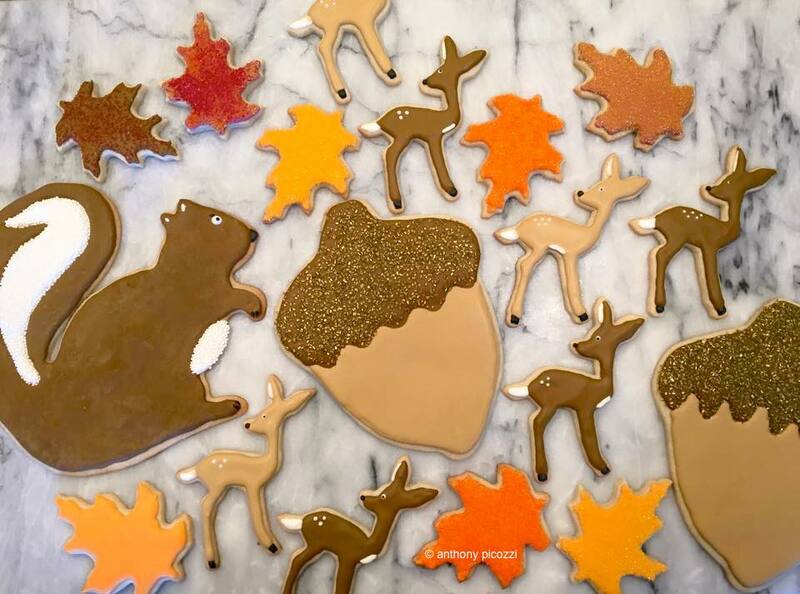 This is the time of year that many of us begin baking and decorating cookies by the dozen for the fall season. 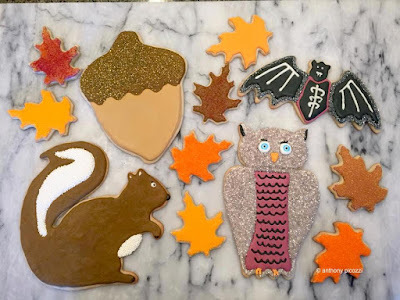 My friend Anthony Picozzi recently created a set of fall cookies in the shapes of leaves, deer, squirrels, acorns and bats, which I had to share here so that you could get inspired. 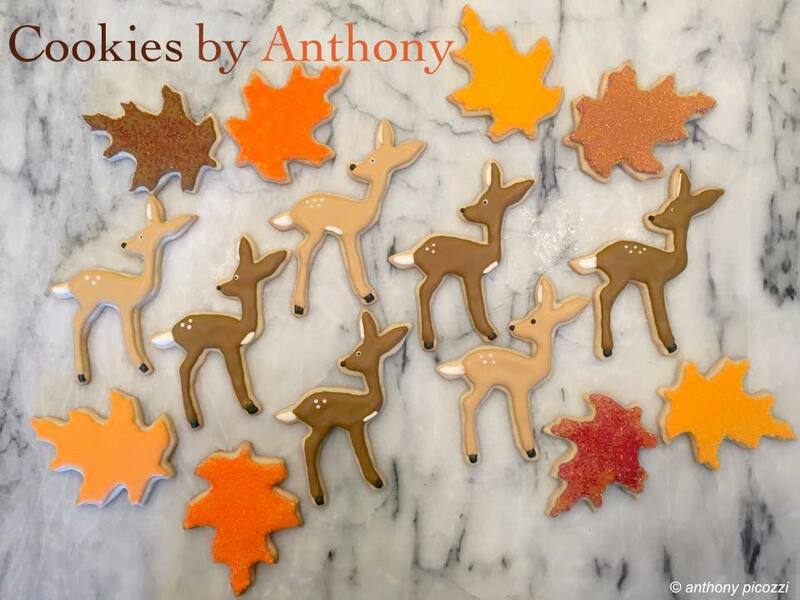 What I love about this set of cookies by Anthony is that he keeps the designs simple, yet he perfectly captures the all-too-familiar tones that evoke the season's splendor. 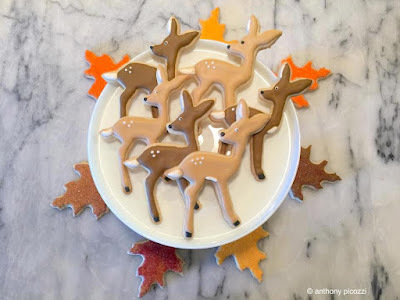 With a few easy to find cookie cutters, as well as a few collectible Martha by Mail copper cookie cutters, Anthony cut out and baked dozens of sugar cookies, and then began to decorate in earnest. Using a good royal icing base, he then set about tinting batches of it in brown, taupe, burnt orange, dandelion yellow, black, burgundy and white. A few sprinkles of sanding sugar here and there on some of the cookies helped give texture, as well as shimmer. 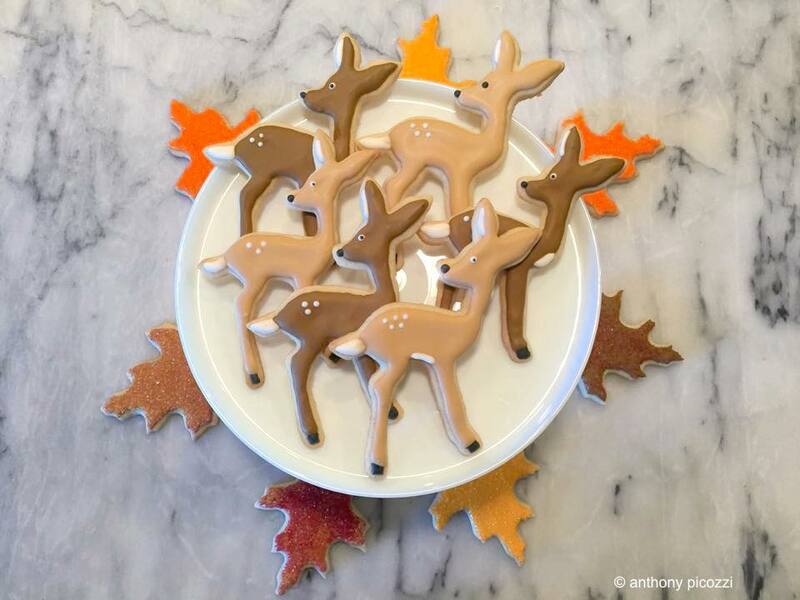 Take a look at some cookies baked and iced by Anthony. This small herd of deer have an inquisitive look as they tilt their heads to see what's behind them. Iced in shades of brown and flax, Anthony gave each fawn their wonderful spots that deer commonly have during their adolescence. A fuzzy white tail, black nose and dainty hooves, make each of these creatures irresistible. I love the shape of this cookie. Capturing the splendid colors of fall, Anthony iced these oak leaf cookies in various shades of royal icing, and then topped them with a sprinkling of sanding sugar in a corresponding color. The platter seems to glitter and beckon you to grab a cookie. If you collect Martha by Mail cookie cutters, the large acorn, squirrel, owl and bat will be instantly recognizable. Made in the mid to late 1990s, the copper cookie cutters that captured baker's imaginations back then, are still inspiring present-day cookie decorators. Aren't these simply marvelous? The giant sugar squirrel was iced in nut-brown royal icing and was given a white tail stripe, a fuzzy white tummy and white eyes. Black accents were placed on the tips of its nose and feet. Adorable! Anthony decorated the cap of the large acorn with a nut-brown royal icing and then flocked it in sanding sugar. The base of the acorn was outlined and flooded with a café au lait-colored royal icing. Tasty and tempting to say the least. My favorite of the bunch was the clever owl. 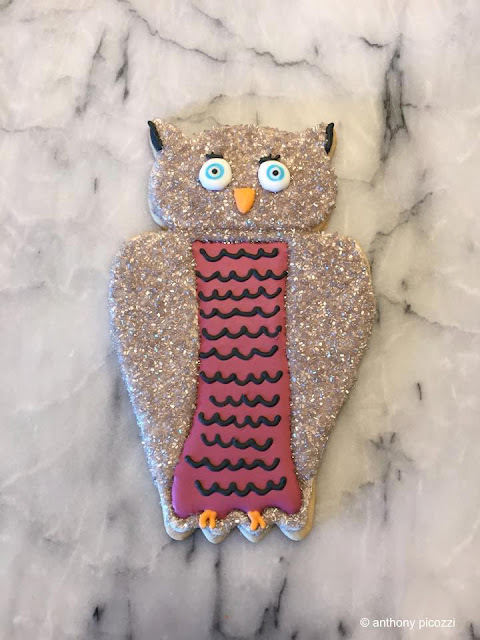 The head and feathers of the owl were outlined and flooded in a neutral-color royal icing, which was flocked with shimmery, silver sanding sugar. This owl sparkles! The underbelly was iced in a light burgundy royal icing and was then given a piped undulating black 'feather' design. With a set of pale orange feet & beak, and bright blue eyes, the inquisitive owl is ready to be placed into a large cellophane bag for gift giving. Who wouldn't want a flock of these for their Halloween party? As charming as it is to see a herd of deer strolling through one's leaf-strewn yard, it's much nicer to encounter them in the form of a cookie, on top of one's marble counter. Arranged on a platter, cookies like these will be a welcomed treat for guests this autumn if you plan on entertaining a crowd for a holiday. 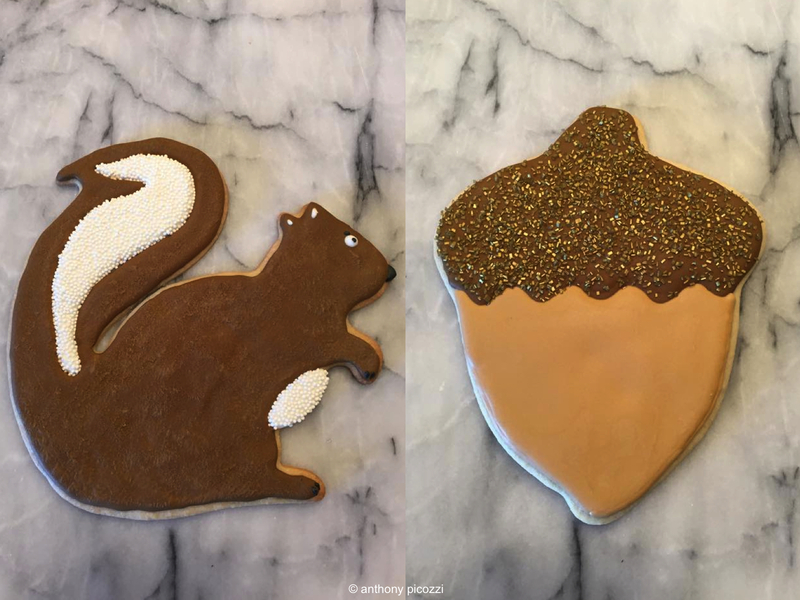 When it comes to cookie baking and decorating, I have seen Anthony's artistic expression grow by leaps and bounds in the course of this past year. Since I'm always looking for inspiration wherever I can find it, it is so gratifying for me when I see friends of mine who make me stop and pay attention. It's a very good thing for me to learn from my talented and creative friends. I want to thank Anthony for not only allowing me to use his wonderfully photographed cookies here on Good Things by David, but also for showing us how to make these charming treats in the weeks to come. 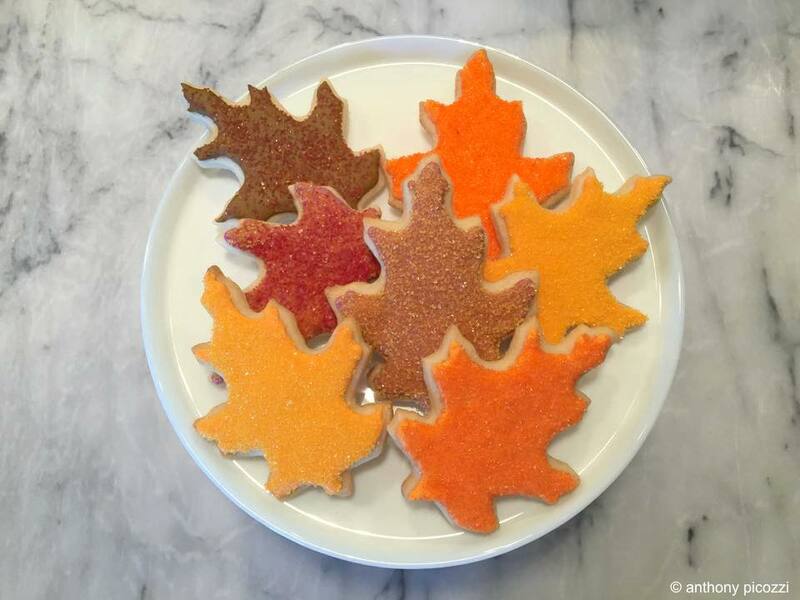 Happy baking this fall season! I just got done making my first ever batch of acorn and squirrel cookies! Anthony's cookies are wonderful. I'm tempted to make some myself. Aren't they beautiful, yorkiegirl2011? I love these treats! Who couldn't love these cookies? Well done! I'm inspired! 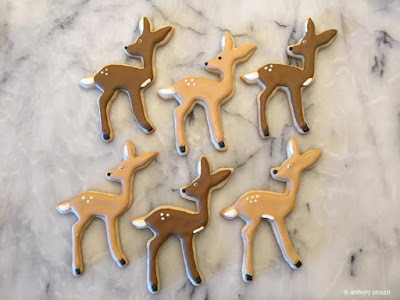 The little deer cookies I created a few years ago remain my favorite of all the shapes I've used! Anthony's deer are even better and more unique because of the way their little heads are hilted to look behind them - as if to look out for an approaching hunter! Oh, No! But seriously, perfect cookies - I especially LOVE the MBM Owl - Anthony outdid himself and you are a great friend to him and to all of us for sharing this with us! Janet, I can't help but remember those deer cookies you made several years ago. They were absolutely adorable sitting on your domed cake stand. Too cute! !